Old Town is considered the birthplace of modern California. Encompassing approximately 230 acres, this area was the site of the first European settlement on the West Coast as well as the home of the first city in the present-day Golden State. The Old Town neighborhood is bordered by Interstate 5 on the west and south, Interstate 8 to the north and Mission Hills to the east. Listed on the National Register of Historic Places, the heritage district is the setting for the Old Town State Historic Park, Heritage Park and Presidio Park. The robust community features numerous museums, theaters, shops and eateries as well as cultural celebrations throughout the year. Archaeological excavations reveal that humans have inhabited the area around San Diego for nearly 10,000 years. When the Spaniards arrived in 1542, they met the Kumeyaay Native Americans whom they called Diegueño. Over three centuries later, Spain established the first permanent settlement in its California colony on a bluff overlooking the San Diego River. Junipero Serra and Gaspar de Portola established the San Diego Mission de Alcala and the San Diego Presidio in 1769, which constituted the first Spanish settlement in Alta California. As the first of a chain of 21 missions stretching northward along the Pacific Coast, it would serve as the cornerstone of California’s exploration and settlement by Spain. While the Mission moved several miles further inland, the Presidio remained in its original location as the town of San Diego expanded around the base of the bluff. Old Town San Diego State Historic Park commemorates this location. The Mexican government designated San Diego as a pueblo, or chartered town, in 1834. It lost this designation four years later when the population declined. Because the settlement was not located in close proximity to navigable water, supplies for the town brought ashore at Point Loma had to be trekked overland along the La Playa Trail. The town plaza is the location where a U.S. Navy lieutenant and a U.S. Marine lieutenant first raised an American flag over California in 1848. The small community, primarily situated in the Old Town area, became the seat of San Diego County when California was admitted into the Union in 1850. A decade later, newcomer Alonzo Horton promoted the development of the present downtown San Diego. Businesses and residents quickly relocated to “New Town” from Old Town because it was situated closer to the harbor and shipping. In 1871, the city and county moved their records to a new courthouse. The new district eclipsed Old Town as the focal point of the city. Old Town was connected to the new downtown area by streetcars in the early 1900s. The expansion of the public transit system was championed by entrepreneur John Spreckles as part of the city’s preparations for the Panama-California Exposition of 1915. In 1968, the State of California Department of Parks and Recreation created the Old Town State Historic Park. This living history museum preserves the rich cultural heritage that characterized San Diego throughout the 19th century. The neighborhood boasts nine hotels, over 30 restaurants and more than 100 specialty shops. The Old Town Transit Center is a major local intermodal transportation hub where you can switch from city buses to the San Diego Trolley Green line. The station also serves the Coaster commuter rail line and Amtrak’s Pacific Surfliner route. Old Town is one of the most visited attractions in San Diego. In addition to food, shopping and live entertainment, the neighborhood boasts historic sites and museums that span the area’s cultural heritage from Mexican rule to its early days as an American state. 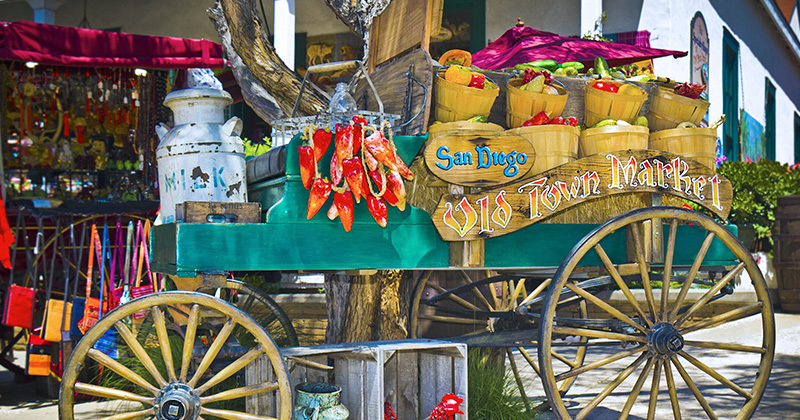 Step back in time as you explore the streets of the Old Town San Diego State Historic Park, a living history museum. View heritage architecture and hear fascinating tales about early California recited by actors wearing mid-19th-century attire and performing daily tasks. You can tour adobe haciendas, historic churches, San Diego’s first schoolhouse and a working blacksmith shop as well as the Whaley House, which is reputed to be the most haunted house in America. 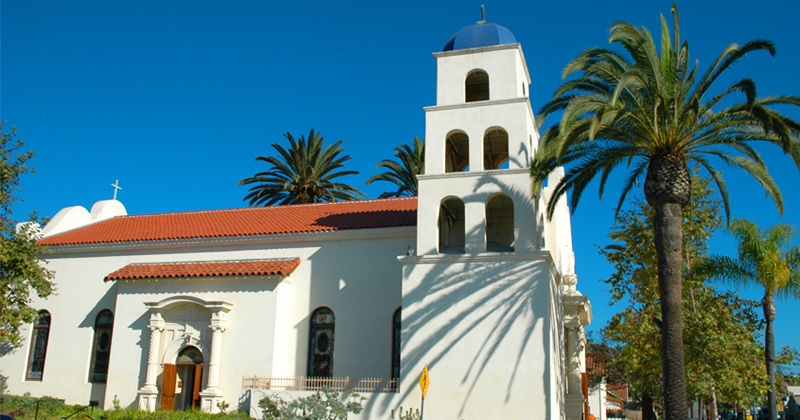 Heritage Park preserves many of San Diego’s finest examples of Victorian architecture along with other historic buildings like Temple Beth Israel, San Diego’s first synagogue. Presidio Park is the location for the original Presidio and the Mission of San Diego that were built in 1769. While the Mission relocated, the fort remained on Presidio Hill. In addition to sweeping vistas of the city, the San Diego River valley and the nearby Pacific Ocean, the park features a museum dedicated to Junipero Serra. The Mormon Battalion Historic Site recognizes the legacy of the only religious-based unit in U.S. military history. The volunteer unit heroically accomplished an overland march of more than 2,000 miles to serve in the Mexican-American War. While the shops of the Bazaar del Mundo offer a variety of handicrafts featuring traditional designs, numerous local restaurants serve authentic and fusion ethnic dishes. In addition to strolling mariachi bands and other street performers, Old Town is the location for the Fiesta de Reyes Stage that hosts traditional Mexican dance and musical performances. The park is also the setting for cultural events like the Old Town Art Festival as well as the Cinco de Mayo, Dia de los Muertos and Fiesta Navidad celebrations. Mission Bay is the setting for the iconic Belmont Park amusement park along with a wide array of water-related activities, including swimming, sailing and surfing. It is also the location for SeaWorld San Diego. Home to the San Diego Zoo, the 1,200-acre Balboa Park features several manicured gardens, amphitheaters and a carousel. The park also hosts numerous museums, including the Fleet Science Center, the Museum of Man and the San Diego Natural History Museum.